1. In his blog Science Fix, Darren Fix began his post Melting Rates with a video that was purposed to open a discussion about heat energy. He placed an ice cube on two blocks that looked identical. 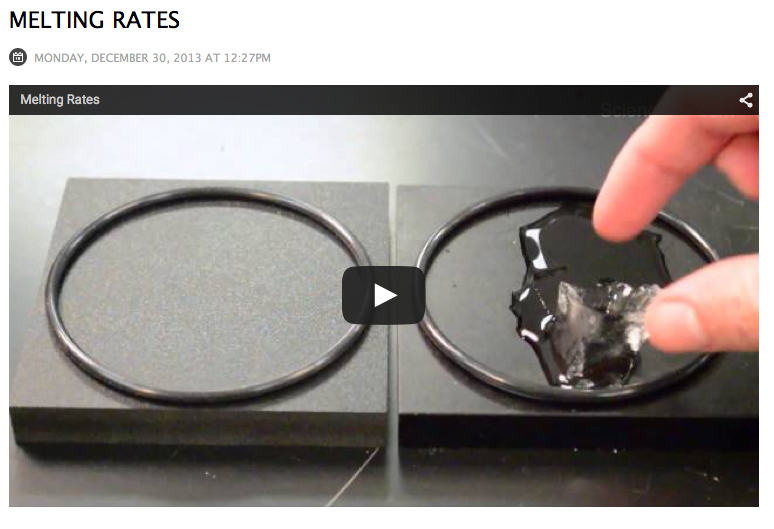 One ice cube melted much faster than the other one. Surprisingly, the block that melted the ice faster was colder than the other block. We found out in the video that the block on the left was made of foam which is an insulator, so heat energy from the counter could not get through the cube to melt the ice. The block on the right was made of metal which is a good conductor, so heat energy flowed through the block to melt the ice. In my comment, I mentioned that I like to use science projects or hands-on type activities to introduce new concepts. I agreed that this demonstration would be very effective in beginning a discussion about heat energy. 2. In his post Scientific Method Box, Darren Fix also began with a video. 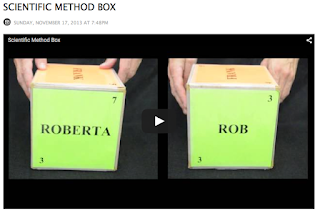 This video showed a five sides of a six sided box, and the viewer was asked to figure out what the sixth side looks like by making observations of the sets of opposite sides. The viewer was shown step by step the observations that could be made about the sides of the box including the color, the numbers in the corners and the names in the middle. Then, he showed a box with the expected results and also a new box with unexpected results. He explains that the purpose of creating a hypothesis is not necessarily to prove it right, but also to get results that lead to more questions to investigate. In my comment, I told him that I stopped the video to try to figure out the sixth side myself. Although I was close to figuring out, I did not get the expected result. This post certainly introduced the scientific method in an understandable way. "He explains that the purpose of creating a hypothesis is not necessarily to prove it right, but also to get results that lead to more questions to investigate." Precisely. Thus one of the mottos of EDM310: Questions are more important than the answers! Mark this blog and use it with your students!